hd = dfilt.calatticepc(k1,k2) returns a discrete-time, coupled-allpass, lattice filter object hd, with power-complementary output. This object is two allpass lattice filter structures coupled together to produce complementary output. The lattice coefficients for each structure are vectors, k1 and k2, respectively. beta is shown in the following diagram. 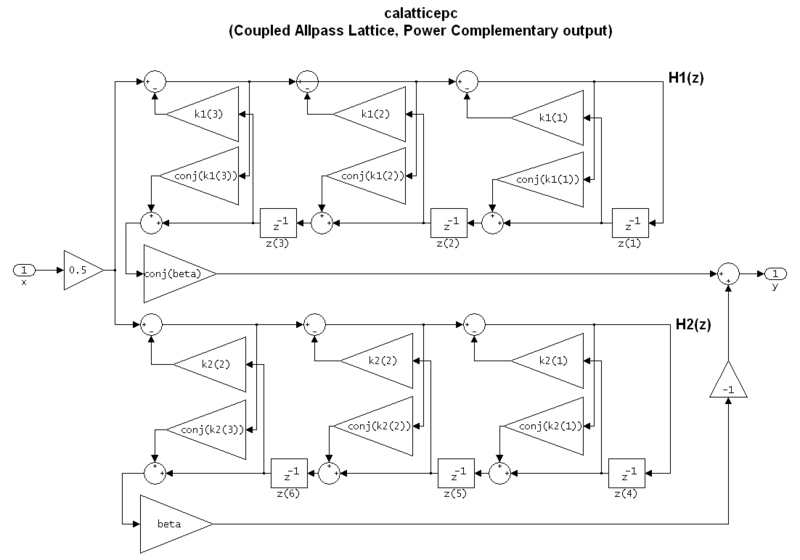 hd = dfilt.calatticepc returns a default, discrete-time, coupled-allpass, lattice filter object hd, with power-complementary output. The default values are k1 = k2 = , which is the default value for the dfilt.latticeallpass. The default for beta = 1. This filter passes the input through to the output unchanged. Specify a third-order lattice coupled-allpass power complementary filter structure for a filter hd with the following code. You see from the returned properties that Allpass1 and Allpass2 contain vectors of coefficients for the constituent filters. To see the coefficients for Allpass1, check the property values.